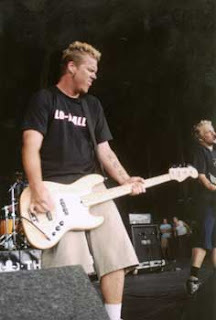 Mike Davenport was the bassist for the Ataris from 1998 to 2005 and 2013 to 2014, appearing on their albums Blue Skies, Broken Hearts...Next 12 Exits (1999), End is Forever (2001) and So Long, Astoria (2003). What people didn't know was that Davenport was part of a company called American Standard, although it went by a number of other names, that scammed about 100,000 people out of $27 million between 2009 and 2016. Davenport and his business partner, Cynthia Rawlinson, have both been charged with conspiracy to commit mail and wire fraud with five counts of wire fraud and one of mail fraud. If found guilty, they each face up to thirty years in prison. According to the Santa Barbara Independent, the St. Louis Field Office of the Chicago Division of the US Postal Inspection Service initiated the action, finding that 104 victims were from the southern Illinois area from which the Ataris came. Reports said that the two took out Craigslist ads showing homes that were in the process of being foreclosed upon and offering them at below-market price, charging a fee of $199 for perspective buyers to obtain full property information. The problem was, there were no homes at the addresses provided or they weren't for sale and, when they complained to American Standard, were told to wait ninety days to request a refund. No refunds were ever made. $104,000 was seized from Davenport when he was arrested and the process of obtaining another $850,000 in his bank accounts is in process. The two principals in the business are set to be arraigned on January 17 in St. Louis.